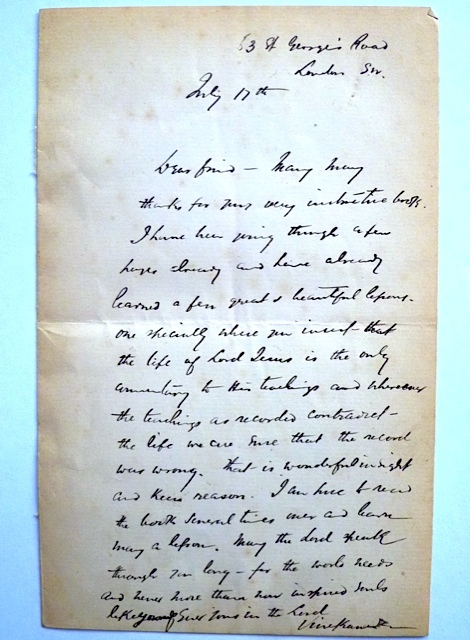 We have received a facsimile copy of a hitherto unpublished letter of Swami Vivekananda. It is sent herewith as an attachment. 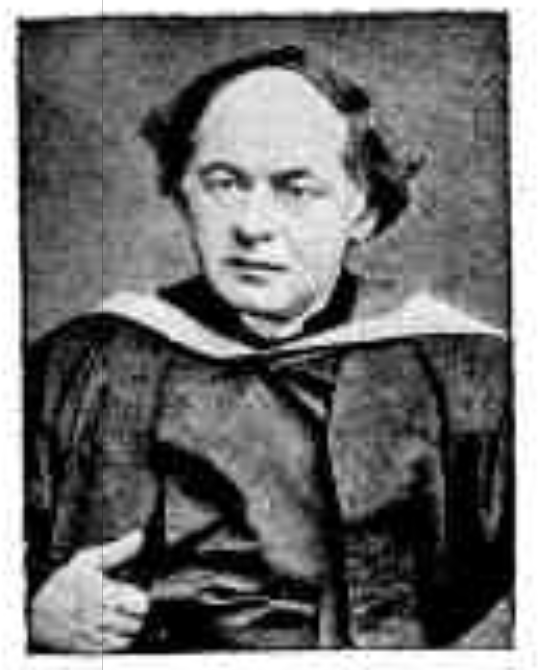 The letter refers to the book The Dead Pulpit by Reverend Hugh Haweis, who was a delegate of Anglican Church to the World Parliament of Religions held in Chicago in 1893. The book was published in 1896. A copy of it was probably sent as a gift to Swamiji whom Reverend Haweis must have met at the Parliament. Details of Swamiji’s correspondence with Reverend Haweis are given in Marie Louise Burke’s book Swami Vivekananda in West – New Discoveries Vol. 4, p.p. 193-4. The original letter of Swamiji was found with the papers of Reverend Haweis’s daughter, Hugolin Haweis. One Mr. Carl Aronsson of London informed us about the letter. Although we requested him to send us the original, he has sent us only a photocopy of it. Many a reader of this blog have requested for a typed version of this above hand-written letter. Here in below is the official transcription received from Swami Atmayogananda of Belur Math. how is any one supposed to read this? Sorry for the inconvenience! I was awaiting an official transcription of this letter from our HQ and hence the delay. I have now placed the typed version under the original letter. May Swamiji ever inspire you! Maharaj, by just looking at the letter and the hand writing my hair stands on ends. How blessed were they who received correspondance from Swamiji. Yes, indeed Yogan, you will be happy to know that Swamiji’s precious hand-written letters are still preserved in the Archives department in Belur Math. Some of them are displayed in the Sri Ramakrishna Museum. We are even now getting new light on the great prophet. Please kindly give a typed copy also. Yes, rightly said! I have now updated the entry by placing the official transcription of the original letter below the photo. Please revisit the blog. Indeed so! One can easily imagine there are many more things about Swamiji still unknown to us. See his humility in his letter! It’s wonderful to glance at this letter! How amazing that Swamiji can still speak to us as if rediscovered anew! With what humility and gratitide does Swamiji write here – He who knew and realised all already! Despite his own astute observations that Swamiji highlights, his references to this book as a lesson to himself, is a grand symbol of his own magnanimity. Thank you for sharing this lesson to us! Happy at your observation on the newly found letter of Swamiji! You are incisive and at the same time analytical. More parts of multi-faceted personality of Swamiji are still to be uncovered. It is very nice to see the original hand written letter by Swamiji! Thanks for this! Indeed so! When you go to Belur Math, please do take time to visit Sri Ramakrishna Museum where the various articles used by Sri Ramakrishna, Holy Mother Sri Sarada Devi, Swami Vivekananda and other direct disciples of Sri Ramakrishna are displayed. Its absolutely interesting. It takes us to those old days and who knows we were also there in our previous births! Makes us nostalgic!! My humble pranam at Your holy feet! Thank You for sharing this letter with us! The timing of this disclosure is so relevent, as we presently celebrate this great lotus-eyed Son of India internationally. I did get the gist of the letter but would appreciate a typed copy thereof. I do share the sentiments of brother Yogan Naidoo. Thanks Nerie for your visit to this blog! Yes, I have now updated the entry by placing the official transcription of the original letter below the photo. I hope it is now easily readable. A special thank you for your prompt response to our request for a typed copy of Swamiji‘s letter. I trust that everyone appreciates your effort in sourcing this for us. I will share this via e-mail with other devotees, as I did with the original. NB: I enjoyed browsing through all the comments and feedback. Your keen interest in forwarding the link to all the other devotees is deeply appreciated. Many, many thanks for including this lovely letter in the blog. It didn’t matter whether one could read the contents thereof – just being able to glance at Swamiji’s familiar handwriting is a blessing enough. All I know is that viewing this newly discovered gem moved me immensely and that I thoroughly enjoyed painstakingly attempting to decipher the words, and more especially, the spirit thereof. Nonetheless, thanks for providing a typed copy. I can only imagine Maharaj’s eagerness to make this letter accessible to us all! May we read this and other letters of Swamiji several times over and learn many a lesson too! For the Lord Himself speaks in these letters. How wonderful is your description! When for the very first time, in Belur Math archives, the Monk-in-charge showed me some of the hand-written letters of Swamiji, I was transported to a joyous region! It was so thrilling to read avidly every word of it. Hand-written messages bring not only the import of the message to the reader but also reaches the flavours of the personality of the writer! How sad that after the invent of computer softwares, we have become so dependent on the typed versions of the words. Yes, technological advancement has brought unimaginable comforts, but at the same time have taken us apart in subtle ways! It reminds me of my manuscript-magazine in Tamil, I used to bring out in my childhood days! The entire magazine was written-down in different inks with drawings and boxes with perfect alignment, people used to wonder how print look-alike it could be! Now not to speak of the spirit of Swamiji’s letter which underlies the importance of Life vis-à-vis the recorded teachings. 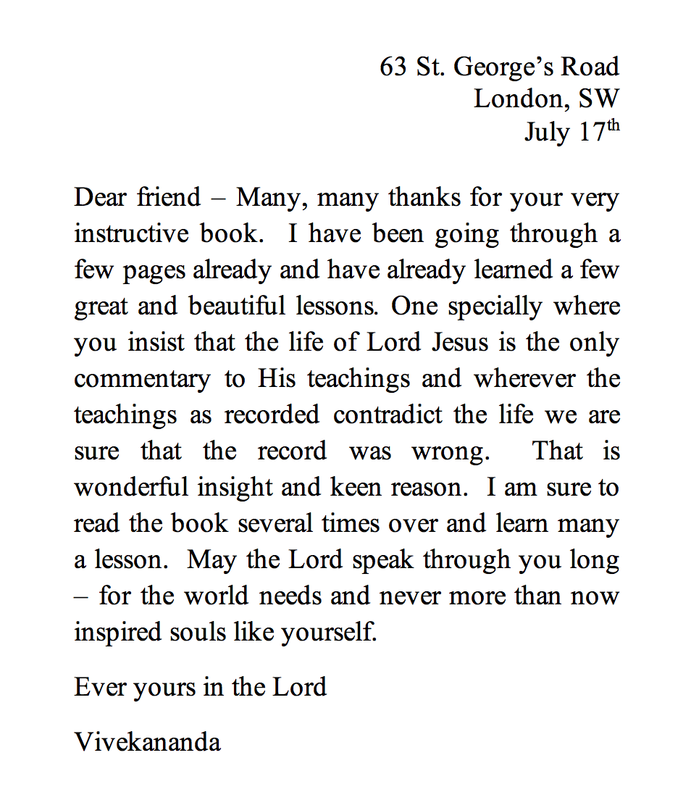 How magnanimous Swamiji was in accepting his learnt lessons from a book, authored by a Christian Monk of Anglican Church! I trust that Maharaj is in the best of spirits and health. I have just read the Vedanta in Practice blog and the update as well, and what a gem Maharaj has shared with us. This letter is indicative of how matchless Swamiji is in the profound and how humble he is when he accepts the book from a holy brother. Swamiji is not a preacher, he is that is all good and spiritual, as indicated in a personal letter to another in the holy brotherhood, and that just overflows as a holy river of spirituality to us that need the teachings. Thank you, Maharaj, for giving us the further opportunity to be touched by divinity. By the Grace of Master, Mother and Swamiji, I have faith that Maharaj will be successful in all of his undertakings. Yes, as I said somewhere else in this blog that renewed assessment of Swamiji’s contribution and his wonderful aspects of his personality seems to be unending and with every new fact that crops up we seem to learn more of him. And I would say its all by his grace only. Thanks for your sincere wishes! Om Namo Narayanaya Swamiji ! It is a great blessing indeed for us to have even viewed the writings of our bold Swami Vivekananda. Just from this, we see how humility is such an extraordinary characteristic as displayed by Swamiji who was such a great soul Himself. Thank you Maharaj for giving us this opportuntiy to view the letter. Your comment is welcome to this blog! As the Sanskrit proverb goes. “vidya dadaati vinayam” – knowledge bestows humility, Swamiji was indeed humble in telling that he learnt ‘lessons’ from the book that he received from the author. Did not his Guru Sri Ramakrishna was most humble before the distinguished people like Keshab Sen and Ishwarchandra Vidyasagar? As is the Guru so is the chela (disciple)! Aum Namo Narayanaya Maharaj, love and greetings to you! It is humbling enough that we got the opportunity to see Swamiji‘s hand written letter which is a great blessing in itself. The contents thereof is so moving and the sweet, humble words written by Swamiji really displays the character of Swamiji, although such a great soul, he still learns from others. Lots of lessons to be learned from this. I am glad that you felt blessed to see Swamiji’s handwriting. Yes, we always learn afresh in every aspect of Swamiji’s personality. May Swamiji’s writings inspire you as ever! increiblemente puedo ver y sentir la letra de Swami Vivekananda gracias al avance de los medios de comunicación a los que dieron la posibilidad de que esto se concretara , a Swami Vimokshananda que compartió con el mundo algo tan sagrado. Es un honor para mi en América del Sur, Argentina, hoy poder tener este material delante de mis ojos Me llenan de su fuerza y me bendicen…Que Dios bendiga a todos los que hicieron esto posible y espècialmente a Swami Vimokshananda que comparte siempre aspectos de Swamiji , de otra manera sería imposible tener acceso a ellos. Gloria a Swami Vivekananda , Muchas gracias Swami Vimokshananda. Jay Thakur ! “Incredibly I can see and feel the words of Swami Vivekananda with the advance of the media who got the chance of this goes through, Swami Vimokshananda shared with the world as something sacred. It is an honor for me in South America, Argentina, now able to have this item in my eyes I bought her strength and bless me … God bless everyone who made this possible and especially Vimokshananda Swami always share aspects of Swamiji would otherwise be impossible to access them.